Start with our Angel chipboard ornament shape and new Christmas rubber stamps. The red tag is stamped with the Tattered Snowflakes stamp with red ink. The chipboard angel ornament is painted with acrylic paints and outlined with the new LePen black drawing marker and the Sharpie white paint marker. Sketch around the edges of the angel with black first, then sketch white on top of the black. Stamp the sentiment and bell with Ranger Archival black ink. Embellish with the wood snowflakes and hand dyed ribbon. p.s. don't forget the rubber stamp and stencil of the week too - the stamp is 30% off and the stencil is 40% off! Beautiful Birds, Winter Flowers, and Pine Cones are included on the new vintage style Christmas Collage Sheets. The Noel Christmas Altoid Tin Kit is fun and easy to make - the kit has everything you need! One silver metal tin that is 2-3/4" x 3-1/2", Christmas 141 Collage Sheet, 1 natural wood snowflake,1 antique bronze 1" bezel, a 3" vintage style snow dusted bottle brush tree, buttons, and a cute snowman with a top hat! Autumn Art Making - 2 beautiful collage sheets FREE with your 25.00 purchase! Vintage Elements 250 Artist Trading Coins Collage Sheet & Thanksgiving 12 Collage Sheet free with your 25.00 purchase. Offer starts today and ends Sunday Sept 30, 2018 @ 3 pm CST. New Halloween Book Kit, Halloween Rubber Stamps, Halloween Collage Sheets! Make Joyful Art Cards with our brand new rubber stamps! New mixed media book kit - and watch the video! Make this "Adorably Vintage" Oh! Sweet Spring Book with all things spring and Easter. Sale price is now thru Thursday March 1, 2018 Noon CST. With Brave Wings Art Kit - Sale Ends Feb. 20, 2018 Noon CST - Make this adorable vintage kit with 1 large wood butterfly, 1 butterfly paper, 1 engraved wood charm, 1 Brave Wings collage sheet printed on light weight card stock that accepts paint and ink, wire for hanger and wire for the antenna, & buttons. Easy and fun to make! New vintage style Valentine Rubber Stamps & Mini Valentine Book Kit! Make this Christmas book special with favorite photos of your family, friends, and don't forget to include your pets all decked out for the holidays! Make 4 festive ornaments with this new holiday kit! Make beautiful autumn cards, tags, and mixed media art with our new Nature Rubber Stamps. The Spirit of Christmas Kit has everything you need to create a beautiful Christmas Mantelpiece that you will love to display for years to come! Create beautiful Autumn Nature Cards and Tags with our new rubber stamps! Charming Halloween Charm Art Kit . Make 6 fun vintage style Halloween Charms with this kit. The Haunted Halloween Book Kit has everything you need to make this fun mixed media book. Mini House Shaped Bird Book Kit! Make this little bird book with collage sheets, rubber stamps, and our exclusive embellishment kit. The Face of an Artist, Nature, Mail Art plus more new rubber stamps! New! By the Sea Collage Sheets! Make some vintage style By the Sea Mail Art with the new collage sheets! A brand new junk book kit loaded with all of the goodies that you love - engraved wood, new collage sheets, and an exclusive embellishment kit! Brand new rubber stamps in the shop today! Birds, jars, post marks plus more - and for all of you early bird Christmas Card makers there is an adorable bunny wearing a Santa hat! Amazing new ink pads created by Tim Holtz that are a fusion of dye and pigment inks! New in the Shop!The size of the Stitched Paper Bag Stash Book is about 3-1/2" x 4-3/4". When the book is opened the size is about 3-1/2" x 7". Each book is made by us in our studio with some of your favorite designer papers. A beautiful Cottage Garden Book Kit for you to make! Nature Cards with Stickers + Rubber Stamps! New kraft stickers today - ovals and rectangles and our favorite 2" circles. We stamped on the kraft stickers with Ranger Archival Ink and our new nature stamps and then EZ PZ added the stamped sticker to a card! Little Bird Mail Art flying out the door today! Book pages, bird tags, and Bird Embroidery! Beautiful butterflies and Victorian Frames for you to make your hand made jewelry or embellish your mixed media art! Vintage Birds, Mossy Mushrooms, Bird Nests, Vintage Post Marks, A Parisian Dragonfly plus more are in the shop today! Original mixed media paper art and jewelry. Each piece is hand made one by one in our St. Louis, Mo. studio. Brave Wings Butterfly Book Kit! Spring has sprung and all of the butterflies are gathering at Red Lead. New Book Kit, stencils, collage sheets, rubber stamps, plus more are in the shop today. Lots of new art, tips, and techniques too. Our hope is that you will be inspired to share our spring has sprung happiness and make something butterfly beautiful today! Learn more! Watch the videos demonstrating how to use the 23 beautiful Artisan Inks colors. 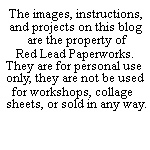 Make vintage style mail art with Red Lead collage sheets and rubber stamps. Art tips and techniques too! The kit is filled with all types of papers, stencils, collage sheets and more! The size of the book is 5" x 10" and is bound with a black metal spiral binder. You are going to love our Little Bird Accordian House Book Kit! Make creative mixed media art with our artistic rubber stamps. Come on in - the water is just fine! Remember your trips to the sea with a mixed media art journal filled with your favorite photos! Beautiful rubber stamps for making hand made greeting cards, artist trading cards, paper tags, and mixed media art. Lovely Paris rubber stamps for stamping in your Art Journals and making Mail Art. Email your Paper Arts projects to us! We would love to see all of your greeting cards, book pages, stenciled art, artist trading cards, tags and more! Email us and we will share your art with other Red Lead art sisters! She Is Joyful - New Rubber Stamps! Scrappy Books made by us for you. 2 new books are in the shop today. A Scrappy Stash Book and a Scrappy Pocket Tag Book. Each book is zig zag machine stitched and waiting for you to add your stash, photos, favorite art, and anything else you can think of - maybe fave recipes? Or how about a girlfriend gift? And for a little while the books are 20% off! The size of the Stitched Mini Tag Book is about 3-1/4" x 3-1/2". Each book is made by us in our studio with some of your favorite designer papers - Bo Bunny, Tim Holtz, 7 Gypsies, Blue Fern, Simple Stories, Prima, plus more as well as vintage book and dictionary pages. A First Day of Spring Tutorial with tips and techniques on how to crackle acrylic paint, make a Bird Song frame, colorize tags with Artisan Inks plus more!